THE NEW ADVENTURES OF THUNDER JIM WADE VOLUME TWO – A STAND ALONE DIGEST NOVEL- DEBUTS FROM PRO SE’S PULP OBSCURA IMPRINT! An independent publisher of cutting edge Genre Fiction, Pro Se Productions announces the debut of the latest volume in one of its most popular imprints featuring the return of an extremely well received character- The New Adventures of Thunder Jim Wade Volume Two: The Horror of Hyperborea by Frank Schildiner. In 2012, Pro Se, in conjunction with Altus Press, a renowned publisher of quality reprints of classic Pulps as well as New Pulp, began Pulp Obscura, a line of anthologies and books that featured classic, often forgotten pulp characters in new tales by today’s best writers. 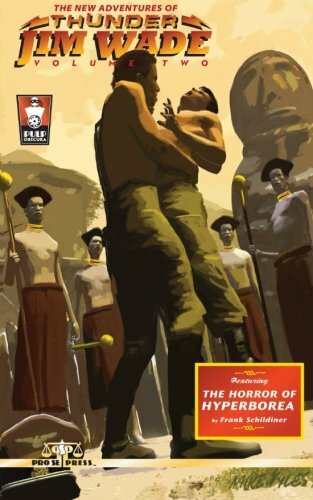 With the release of Horror of Hyperborea, Pro Se and noted Genre Fiction Author Frank Schildiner bring back one of the most popular characters featured in the Pulp Obscura imprint. Under the pen name of Charles Stoddard, legendary science fiction author Henry Kuttner created Thunder Jime Wade, who was raised in a hidden valley by descendants of an ancient Cretean society. Armed with a secret of making a special metal alloy that brings him fabulous wealth, Thunder Jim wade makes his home on a mysterious island hidden in the heart of the South Pacific! Climb aboard the fabled Thunderbug and join this Titan of Adventure and his friends, Dirk Marat and Red Argyle, as they continue their ongoing mission to eradicate evil. A madman’s desperate quest for a fabled lost civilization! A brilliant scientist kidnapped! A menace unimaginable! These are fragments of a greater mystery that sets Thunder Jim Wade on a collision course with The Horror of Hyperborea! From out of the Past comes a new tale of a Hero who strikes like thunder! Featuring stunning artwork by Mike Fyles, The New Adventures of Thunder Jim Wade Volume Two: The Horror Of Hyperborea is available on Amazon and at Pro Se’s own store at http://tinyurl.com/k4xzr23 for $9.00 in a print edition formatted and designed by Sean Ali. This latest Pulp Obscura volume is also available as an ebook designed and formatted by Russ Anderson for $2.99 via Amazon, Barnes & Noble, and www.smashwords.com. Also, thrill to the original adventures of Thunder Jim Wade with the beautifully designed reprint volume available from Altus Press http://www.altuspress.com/shop/thunder-jim-wade-the-complete-series/ in both digital and print editions. For interviews with the authors or more information on this title, contact Morgan McKay, Pro Se’s Director of Corporate Operations, at directorofcorporateoperations@prose-press.com.